Daech & Bauer Roofing has become one of the most trusted roofing contractors in the Fairview Heights, Illinois area by offering an unparalleled level of dedication to customer satisfaction. Our passion for our work is reflected in the level of craftsmanship we provide, and with more than 10,000 projects successfully completed to date, we are proud to be a roofing company that both residential and commercial clients depend on. Water resistance – The roofs we install feature underlayments and barriers designed to prevent water intrusion due to ice damming, wind-driven rains, and normal water flow. Durability – We provide a solid layer of defense against blow-offs, particularly in the roof’s most vulnerable areas. Ventilation – We ensure sufficient attic air flow to reduce heat and moisture buildup, which can speed roof deterioration. This can also reduce heat transfer, which can lessen the workload on your HVAC system and produce monthly energy savings. 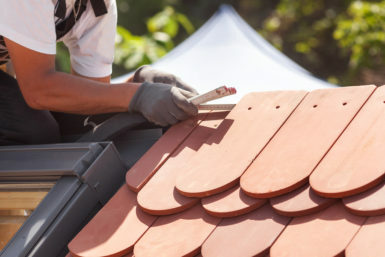 At Daech & Bauer Roofing, our “apples to apples” guarantee states that we will match any local roofing contractors that offer the same service for a lower price. And, we back our work with a five-year labor warranty, in addition to manufacturer materials warranties. To learn more about our services and our experienced team, contact Daech & Bauer Roofing today.